Are you experiencing fungal toenails or an irritating odor in your shoes? Most people are aware that shoes are the perfect place for fungus to grow. Shoes harbor an enormous amount of bacteria and fungus. These certain types of bacteria grow in these environments and cause fungus to grow! These types of fungus can cause fungal toenails which is a condition called Onychomycosis. Toenails begin to look yellow and can become thickened causing an unpleasant appearance. Continuous exposure to bacteria living in your shoes can put you at greater risk for a multitude of bacterial infections. There are many ways to treat fungus. We have topical applications, medications, lasers and other options. While most people are busy treating their feet to get rid of the fungus, they neglect their shoes! After spending time getting rid of the problem, it returns because people forget to treat their shoes who are harboring the bacteria. 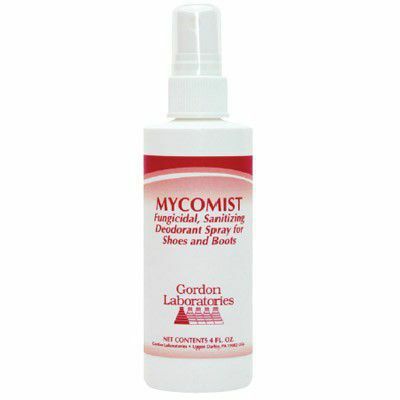 Mycomist helps to disinfect your shoes by creating a less desirable environment for fungus and bacteria to grow. Mycomist will even make your shoes smell better! All you need to do is spray the Mycomist into your shoes the night before each use. When you are resting, the Mycomist will go to work and kill the bacteria and fungus that causes the fungal toenails and unpleasant foot odor. After a few treatments the odor will improve! Unfortunately this is not the only treatment for fungal toenails but it is one that is highly regarded in our practice and essential to treating and preventing further fungus from forming in our shoes.